M Shadows has revealed that he’s kept late Avenged Sevenfold bandmate Jimmy ‘The Rev’ Sullivan’s number in his phone. The drummer died in 2009 – but the vocalist says that, no matter how much time goes by, he’ll never complete get over the tragedy. Shadows tells 2 Hours With Matt Pinfield: “18 years of my life, he was literally at my house every single day. “When you lose some that close, it’s at times worse than losing a family member. Your whole world is ripped apart – everyone that knew him is a wreck emotionally. He adds: “There’s all those moments where you’re like, ‘Man, this would be great if he was here for this,’ or you want to call him – his number’s still in your phone. 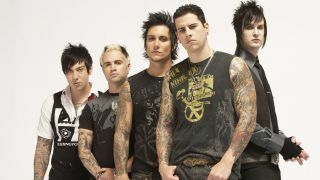 Avenged Sevenfold sneak-released seventh album The Stage last month. They’re featured in the current edition of Metal Hammer, on sale now in print and via TeamRock+. They tour Europe starting in January – dates below.